When deciding to bring a new pet into a home, people create checklists of items that will help make the pet more comfortable and happy…..tasty treats, cute sweaters, plush dog beds, and maybe even toys galore. However, one item that may never even make it on the list is the need for behavior or obedience training. January is designated as “National Train Your Dog Month” for very good reason - people who take the time in working on core obedience skills with their dog tend to have stronger bonds and a more fulfilling experience as a pet owner. Why is training your dog so important? There are a multitude of websites which offer advice on pet training, and unfortunately, not all of them are good consult. Some can even be downright harmful to your pet or set in motion a lifetime of fear, anxiety and stress. It’s important to find reputable trainers who embrace positive reinforcement strategies. This will help build your dog’s confidence and trust in you. Training which inflicts punishment is harmful to the emotional and social development of your dog. Once you find a training opportunity which you feel comfortable with, try to enroll before your puppy is around 8 weeks of age. This is a critical time in his or her development. (Make sure your pup is up to date on vaccinations!) If you adopt an older pet, ask for appropriate classes or possibly even in-home training to help get your pet started off on the right paw! By having these commands and experiences to rely on in new situations, your dog will be calmer, more confident in knowing what to expect and have an association draw from on how to behave properly. By spending time with your pet in training, you are helping them burn mental energy - right along with physical energy. It’s often said, “A tired dog is a good dog!” - and there is some merit to this. By giving your dog tasks or a job to do, you’ll notice a significant impact on the leftover energy they have each day. You’ll likely notice a calmer, more rested canine. This leaves less time for shredding furniture, chewing on shoes, digging, or other inappropriate behaviors. Training Helps YOU Be a Better Owner! By spending time with your dog, you’ll learn how take cues from his or her body language -- subtle, as well as not so subtle. By recognizing moments where your dog is becoming stressed, even slightly, you can redirect the behavior into something positive or remove your pet from the stress-inducing situation. For example, if a neighbor comes to visit and you notice your dog licking or persistent yawning, you’d know that this is an experience which is causing stress, not necessarily excitement or boredom. You’ll know that this is a situation in which you should intervene, potentially before it escalates, possibly into even a fear bite. 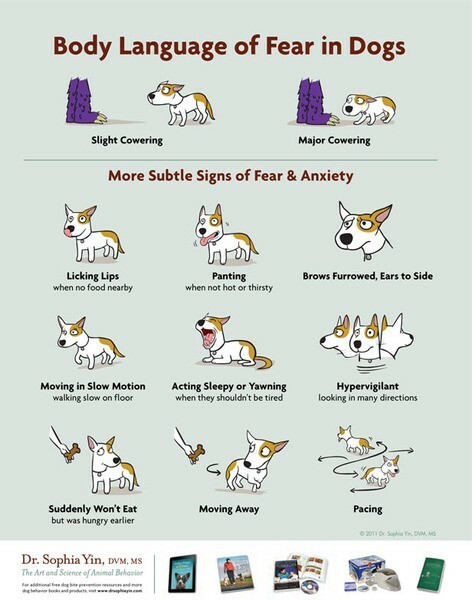 This infographic by Dr. Sophia Yin clearly illustrates body language of fear and anxiety. It’s a good reminder that fear doesn’t always look like we think it may. Time in training with your dog helps keep these stress signals in mind. If you’re looking to learn more about pet behavior and ways to help enrich your pet’s life through behavior training and understanding your pet’s “language”, ask one of our veterinarians, and we’ll point you in the right direction. There are several behavior issues that can be solved, or at the very least, mitigated with proper training. Important to note: any time that your dog has a change in behavior, such as seeming to forget potty training, when it previously was a well-known skill for him or her, there may be an underlying medical cause, so be sure to contact us. What Do You Need to Know About Dog Bite Prevention? New Pet? Let's Get Started off on the Right Paw!